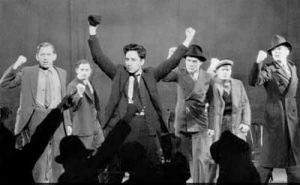 Loosely based on the Union Strike of the Taxi Drivers in New York City, Clifford Odets’ Waiting for Lefty has left a legacy for American Theater as one that broke the fourth-wall and created a new connection between the audience and actors. Odet’s work in the legendary Group Theater was received very powerfully by the audiences and created a connection between the leftwing labor politics and arts. Considered today as one of the masters of Modern American Theater Clifford Odets was part of the legendary Group Theater of New York that was initiated during 1930s. The funding for the group’s work was established by the President Roosevelt’s Federal Theatre Project that allowed the artists of Great Depression to survive and establish a form of theater that paved the way socially-conscious artistic theater movement in big cities such as New York, Los Angeles, Chicago, Seattle. The social commentary in these plays tackled the inequality, poverty and the economic crisis of 1930s America. Wıth Professors Daniel Johnson and Joanna Mansbridge. Daniel Johnson received his Ph.D. in History from the State University of New York at Binghamton in 2011. He has Master of Arts degrees from SUNY-Binghamton and New York University, and earned his B.A. in English at the University of Minnesota in 2002.Dr. Johnson is a social and cultural historian of the early modern Americas. His research focuses on the connections between political economy, labor, and popular culture between the sixteenth and eighteenth centuries. His research and teaching interests also include social movements, racial formation, Native America, early modern Europe, technology and environment, educational theory, historiography, and digital humanities. Dr. Johnson is currently working on two book projects, and his articles have appeared in the journals Cultural and Social History, Pennsylvania History, Monthly Review, and New Politics. Joanna Mansbridge received her PhD in English from the Graduate Center, City University of New York in 2010. She earned her MA from Simon Fraser University in 2005 and BA (Honors) from the University of Regina in 2003. She has taught at the City University of New York and at universities on both Canadian coasts, joining the Department of American Culture and Literature at Bilkent University in fall 2014. Joanna’s research interests span modern and contemporary American theater, performance studies, film and visual culture, and gender studies. Grounded in cultural materialist, feminist and queer theory, her work is concerned with the history and material effects/affects of performance and is attentive to all levels of cultural production. Her book Paula Vogel (University of Michigan Press, 2014) is the first book length study of the playwright. Other articles and chapters appear in Modern Drama, Comparative Drama, the Journal of Popular Culture, Canadian Theatre Review, Methuen Guide to Contemporary American Playwrights, and Women and Comedy: History, Theory, Practice. She is currently working on two projects: the first, Dragging History, focuses on contemporary US drama and the other, Feathers and Flesh, traces a genealogy of global popular and political performances. She is on the international advisory board for the performance studies journal, Performance Matters.